The pedigree does not get much higher than Biserno, the latest creation of Marchese Lodovico Antinori. Lodovico formerly owned the elite of the Super-Tuscan wineries: Tenuta dell Ornellaia, makers of Ornellaia and Masseto. In 2002 he sold his interest to his partners the Mondavi-Frescobaldi Group. For the Biserno venture he has partnered with his brother, Marchese Piero Antinori, president of Marchesi Antinori, the winery that arguably created the Super-Tuscan brand with his ground-breaking Tignanello. So it was with considerable excitement that I happily accepted George Wong’s generous invitation to taste these wines at a small, gentlemen-only dinner party at George’s beautiful home. The Biserno Estate is located in the Upper Maremma, the tenderloin district of Western Tuscany. It sits among the hills of Bibbona, a village not known for winemaking, just North of the more famous Bolgheri, and close to the shores of the Mediterranean, where their cooling influence enhances the regions wine. “The vineyards of Bibbona and Bolgheri meet each other, reminding me of Saint Emilion and Pomerol,” commented Lodovico on their website. No doubt the soil composition of alluvial silt and clay contributed to this reminder. This is the most awarded viticultural region in Italy and home to other very prestigious wineries such as Sassicaia, Redigaffi, La Macchioloe and most recently Angelo Gaja’s Ca ‘Marcanda. Dante Scanavino, then general manager at Ornellaia, introduced the property to Lodovico. He was struck by the similarities between this property and that of Masseto, Italy’s most famous Merlot-based wine. Lodovico decided to plant the property to exclusively Bordeaux varietals, mostly Cabernet Franc, which he believed would thrive on this particular site. Merlot, Cabernet Sauvignon and some Petit Verdot are also grown and round out the blend. These vines cover 47 hectares and are 12 years old. Consulting to the winery is the famous, globe-trotting oenologist Michel Rolland, who counts many of the world’s best wineries as clients. Wine making is conducted by Swedish-born Helena Lindberg, who was educated at the Faculte d’Oenologie in the Languedoc and has made wines for Australia’s Yalumba and continues to make wines for Lodovico’s other Italian venture, Campo di Sasso as well as for their New Zealand venture. Viticulture and production falls to Ranieri Orsini, who tended the vines for seven years at Ornellaia. The cast of characters does not get much better than this! This wine dinner was easily among the very best. George is such a gracious host and the food and wine paired brilliantly and were utterly delicious. We began the evening with a Champagne reception. George chose an excellent trio of Blanc de Blancs Grower Champagnes. We won’t do individual tasting notes (for brevity) but each I would rate as excellent. We started with the Diebolt Vallois Prestige Brut which screamed Blanc de Blancs with its toasty, leesy flavours but had a richness to it that pure Chardonnay seldom achieves. 100% Grand Cru fruit from Cramant and Le Mesnil. We followed that with one of our favourites of the growers: Larmandier Bernier NV Extra Brut, also a delicious wine and showing a little more restraint than the others. I believe this wine has zero dosage and will thrill those who like their Champagne to be extra dry. We finished off with a wine we have been wanting to try: the NV Varnier Fanniere Brut Blanc de Blancs Grand Cru. Fruit comes in equal parts from Avize, Cramant and Oger and receives 10 grams dosage accounting for a richer mouthfeel. A great way to end the flight and a perfect pairing with delicious appetizers of crab cakes, watermelon with goat cheese and burrata with puff pastry, prepared by Chef Sube (formerly of Quattro) and his superb staff from The Social Caterer. We sat down to beautifully set tables that looked out on to Coal Harbour through huge floor to ceiling windows. Even on a dreary rainy evening, the view is stunning. 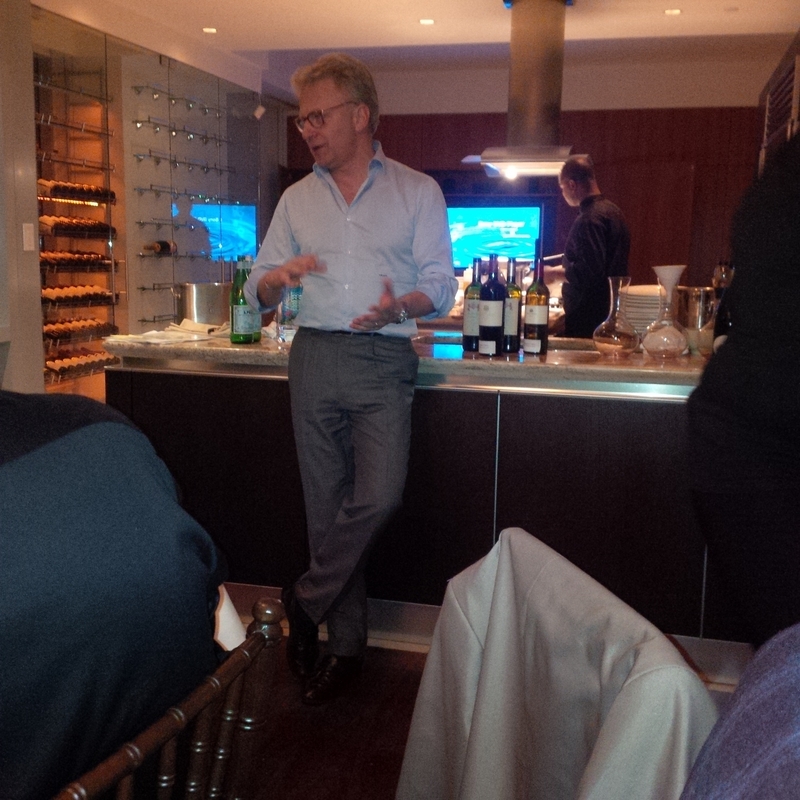 Vittorio Mazzetti d’Albertis is Tenuta di Biserno’s External Relations Director and he led us through the tasting. Vittorio speaks perfect English but with a strong Italian accent. As he pauses to search for the correct descriptor in English, his speaking develops a cadence that becomes almost poetry-like; his sentences become stanzas. His passion for his wines, and for life, comes through in spades and his audience of 16 wine aficionados becomes more and more enrapt as we listen intently to his descriptions. We start with two vintages of Insoglio del Cinghale IGT, from Campo di Sasso, the 2013 and the 2012. The wines are vinted from roughly equal parts of Syrah, Cabernet Franc and Merlot with a touch of Petit Verdot. The wines paired wonderfully with the delicious steak tartare with quail egg on top, as their soft and early approachability was just the right match for the delicate texture and rich yet spicy flavours of the tartare. It was interesting to compare the two vintages as the riper 2012 vintage seem to emphasize the Syrah and the red fruit, while the 2013 brought out more of the spiciness of the Cabernet Franc. Both wines were Very Good/Excellent on the Advinetures Wine Rating Scale. We then moved on to a spectacular and intensely flavoured pasta with four mushrooms and shaved truffles that was simply out of this world! It is in contention for the best pasta dish I have tasted. The Social Caterer’s food set a high bar for the wine to match, but the Il Pino di Biserno IGT was up to the task. Cabernet Franc usually comprises around 40% of this blend with 30% Merlot, 20% Cabernet Sauvignon and 10% Petit Verdot. When I asked him about the blend, Vittorio noted they do not slavishly adhere to any formula for their blends but make the most of what the vineyard gives them each vintage. One of the guests brought 2 bottles each of the 2006 and 2008 from his personal cellar. Trialto had provided the 2010 and the 2011 so we had a good look at this wine through the recent vintages. Each wine expressed a confectured cherry note that one participant described as (and quite accurately) “red nibs” and he noted the almost Gamay-like quality, which was more noticeable in the more recent vintages. The 2006 demonstrated the ageabilty of the Il Pino while the recent vintages confirmed their forwardness and charm in their youth. Each Il Pino we rate as Excellent and each would be a classy addition to any cellar. My personal favourite was the 2006, followed closely by the 2010, which Vittorio explained was a tricky, cooler vintage where you had to make a gamblers choice to pick around the rain. Vittorio wasn’t playing favourites but he expressed a general fondness for cooler vintages citing their ability to produce more food friendly wines. With the delicious Osso Bucco over polenta and roasted vegetables we were served the centre piece of the portfolio, the 2010 and 2009 Biserno IGT. The blend is similar to Il Pino but here the dials are turned up. We’ll blend the tasting notes for the two vintages together as they showed more similarities than differences. This is where if we were at a tasting room where there was spitting, we would not have. The wines are sensational. Very dark, with almost no fade at the rim. The cherry flavours and aromas of Il Pino are magnified in the Biserno and shift from red to black. The confectured, Gamay tones are replaced with mocha, baking spices, and the lovely floral notes of the former wine remain but seem amplified. The body is medium to full and the palate has a decadently smooth texture to it and is supported by noticeable tannins making us think this is a wine to re-visit and enjoy again in 5 or 10 years. The finish goes on for almost a minute and leaves you with a delightful, minerally after-taste. Both wines are Excellent/Extraordinary and show the sophistication of their pedigree, and that pedigree ensures they will be keenly sought by collectors. Get them while you can! 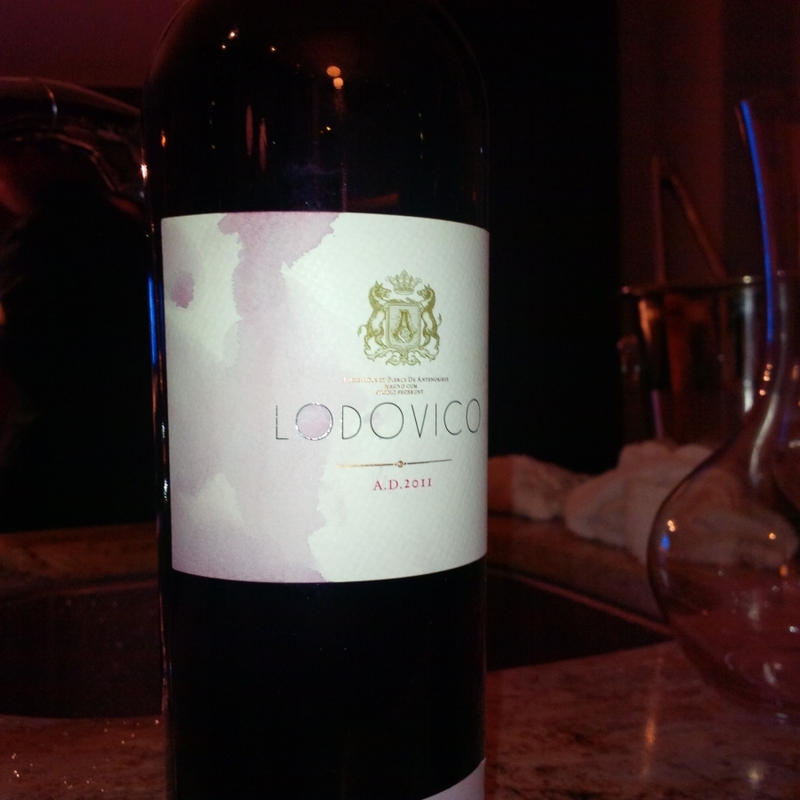 For the last bites of the Osso Bucco we were treated to the extremely rare 2011 Lodovico, made only in exceptional vintages. The wine is made of 95% Cabernet Franc and 5% Merlot and is a sensational wine by any standard. The floral nose was now in evidence as a part of the Biserno signature, but here it had shifted back toward the red end of the spectrum. Flavours of blueberries, plum and exotic spice shift and change and beguile you and send you back for another taste of their striking depth. For us it was the mouthfeel that set this wine apart from and above its bretheren: it was thick and plush and would turn the heads of the most ardent Pomerol-lover. This wine has already approached the status of its cousin Masetto, and as the now 12 year-old vines age, subsequent vintages could even surpass that storied wine. Extraordinary. We finished the evening with a NV Penfolds Grandfather Rare Tawny. As I had happily accepted each subsequent pour of the Biserno and Lodovico I was offered, I only had a sip of this delicious Australian version of a Port and so no tasting note is provided. Thanks again to George Wong for hosting such a memorable evening, to Chef Sube for the delicious food and to Vittorio Mazzetti d’Albertis for adding so much to the wines with his passionate explanations.